Sometimes I don’t post here for a while, but this doesn’t mean I’m not doing anything! On the contrary it means that so much is happening I need time to sort it all out in my head before I post anything. I don’t like to post on here until I’ve got to the end of a trail, found an answer, got a result. But it suddenly occurred to me that perhaps I should post about the in between research. Sometimes people tell me I’m so lucky to find so much information and so many ancestors, when they just keep hitting brick walls in their research. Well, it isn’t ‘luck’! It’s hard work, it’s looking sideways, going down dead ends and spending loads of time on websites, social media sites and in the library. A few years ago I took a foundation degree at Sussex University and one of the things I learnt about studying was to be sure to track the trail that led you to your findings. So you can easily show ‘this is how I got there’. So, I gradually learnt to put on paper the trail I followed. To use language that can be easily understood. And it occurred to me that maybe it might be helpful to me, and to you, if I did that here. If I blogged more often about was I am doing! At the moment I am caught in a whirl of different surnames and families. Sometimes nothing happens, and at other times, such as these, too much happens on too many fronts. So I find myself juggling with Dinnis/Cleeve/Cockett/Howells families with many of them making contact on email or ancestry. I’m a creative writer, an artist, not a logical information processor. My brain gets tired easily! I have just posted a blog about photographs, and how you can date old photos by hairstyle, dress and pose. 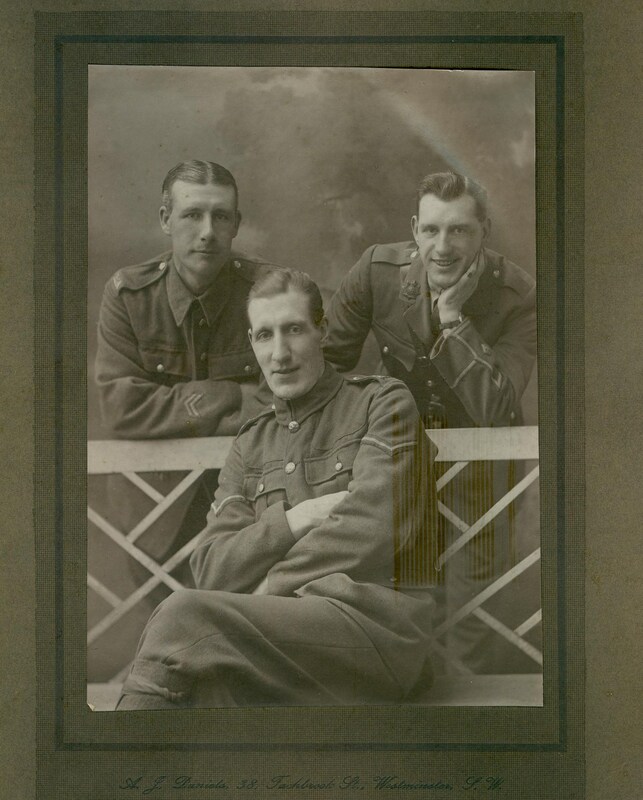 I have just begun looking more closely at my paternal grandfathers family photos showing the three sons in WWI uniform. I have realised that by scanning and then zooming in, it might be possible to focus on the uniforms to trace which regiment they were with. Here is the photo I am using, and I will post more as I find more information. George John Dinnis, front, Harry Leonard Percy Dinnis, standing left, Joseph Taylor Dinnis (my grandfather) standing right. This entry was posted in George John Dinnis, Harry Leonard Percy Dinnis, Joseph Taylor Dinnis and tagged blogging, brothers, Family History, foundation degree, Studying, Sussex University, World War 1. Bookmark the permalink. Living in hotel for 5 days and closing on my new home June 23 it’s been 2 months of disarray til I get moved in and settled! But I do enjoy as well as my sisters who have been moving as well! Don’t give up on us either! We love you Jackie and appreciate this connection and new found Family!!! Hi Jemma, you are so good at this ancestry stuff 🙂 I’m just looking out my grandfather’s information, I think he was in the Hampshire Regiment but I can’t quite remember! Too many people on the go at once here! I’ll get back to you, and thank you for the comment. Thank you so much for sharing your process. We are almost done unpacking and getting organized…i can’t wait to get started.